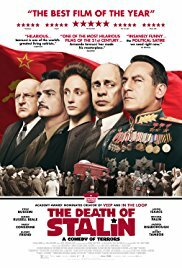 The Death of Stalin is a penetrating black comedy that includes some standout performances from a stellar cast. At times both amusing and horrifying, the movie offers a snapshot of a world in chaos, where jockeying for position becomes a matter of life or death. I did spend a good portion of the early part of the movie wondering where Jason Isaacs was, but they did give him a grand entrance, complete with coat tossing, when he did arrive. Overall, I am awarding the film four stars. It was funny and provocative, and I am certainly glad I saw it. However, I am not sure it's one I would keep re-watching; once was enough.